"I'm thrilled that at long last a speaker manufacturer decided to build a lifestyle system with all the care and quality it normally lavishes on its cost-is-no-object gear. After an hour, I was convinced that the Paradigm MilleniaOne/MilleniaSub combo is one of the best lifestyle systems I've reviewed. And after 4 hours, I was convinced it's one of the best speaker systems I've reviewed." 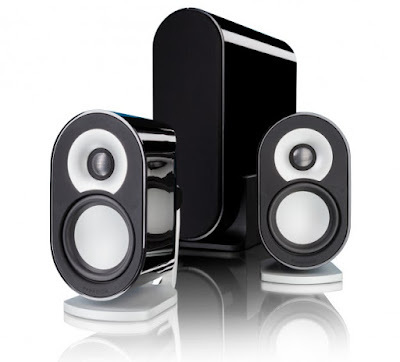 In January 2012, Sound + Vision announced their Product of the Year for 2011 and much to our surprise, (though not theirs), the MilleniaOne and MilleniaSub were the chosen ones! Paradigm's Millenia CT "A 2.1 encore to our favorite compact 5.1 speaker system"
"It just so happened that I had had several soundbars in my listening room for testing for a couple of weeks before I received the Millenia CT. I’d gotten used to the soundbar sound, and I was amazed by the difference in performance when I switched to the 2.1 system." "The close spacing of the drivers and the well-designed crossover gives them excellent dispersion and exceptionally clear and natural midrange. Watching the DVD of Star Trek Generations, I was struck by how good the dialogue sounded." "I was also struck by how big and enveloping the sound was... The subwoofer is more than adequate to fill out the sound from the satellites.... The Millenia CT plays good and loud, too. It’s quite listenable even at full volume." "Where it really shines is as a relatively inexpensive sound system for a TV, because it completely blows away almost any soundbar. It’s also a great choice for a computer audio system, because it’s compact and vastly better than almost all of the desktop audio systems I’ve heard. A hell of a lot of great sound for $699." Here's hoping you think so too! Click here! to read Sound + Vision's review of the Millenia CT.